We are super excited here at Live it. Love it. Make it HQ this week, we have some very fun announcements to make! Here goes number one! Some of you will know already, but today we officially announced 'Live it Vintage' to the press, so now we want to officially announce it to you, our lovely blog followers. Live it Events is a non-profit organisation, which put on events to help communities grow. We want to help local companies and organisations get exposure to their local community, whilst having loads of fun! Due to the Olympics last being held in the UK in 1948 and the Queen’s coronation in 1952 we find ourselves in a celebratory mood and one that brings out our Vintage side. Maidenhead is a busy town this summer, not only is the lovely Dorney Lake one of the Olympic sites for Rowing, Kayak and Paralympic Rowing events; Kidwell’s Park is also hosting a Live Site for everyone without those special tickets to come and take in the Olympic games on home-turf. With all these extra people in town to cater for and the chance to show off the Town’s talent, the idea of celebrating this once-in-a-lifetime event was born. The Live it. Love it. 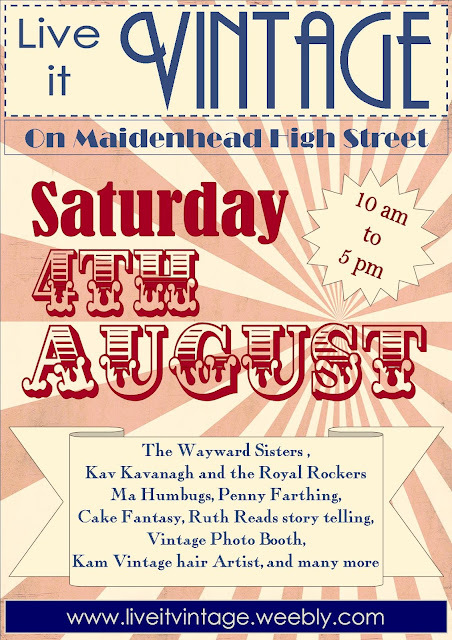 Make it girls, Thumbelina Design and Penny Farthing decided - with a little help from our Town Centre friends - we would get together to bring ‘Live it Vintage’ to Maidenhead. Live it Vintage is all about bringing vintage style to the residents and visitors of our High Street. 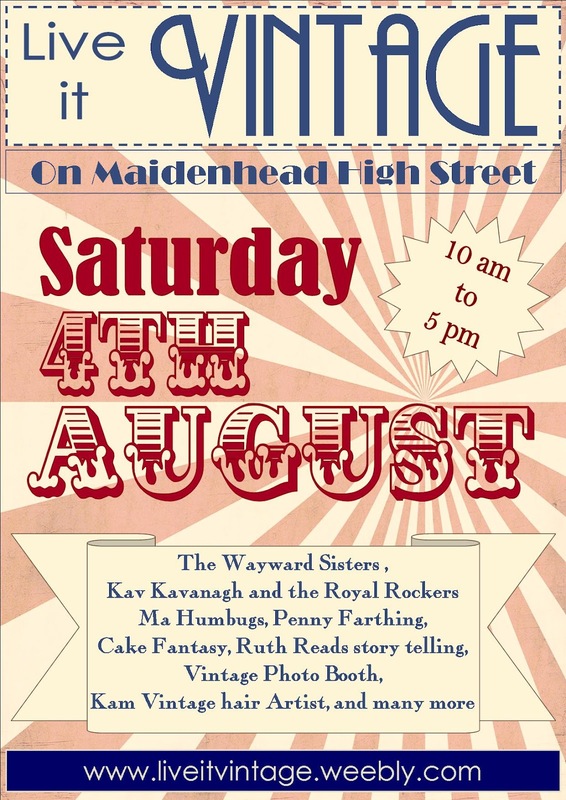 On Saturday 4th August all manner of Vintage traders and activities will take centre stage in Maidenhead Town centre for ‘Live it Vintage’ from 10am through to 5pm. It will take the form of a market spread through the town centre and the Nicholson’s Centre with entertainers, make-up artists and Vintage Vehicles all taking part. You can have your hair done in a Vintage hair roll, listen to some retro music or just take a wander around the various stalls to see what goodies you can take home with you. The Wayward Sisters will bring their ‘Vintage red lips and victory rolls with milk and honey harmonies’ to the event and Kav Kavanagh’s Royal Rockers will have you Jiving down the High Street. If you would like to get involved or want more information then please do get in touch at liveitloveitmakeit@gmail.com. We have also have an event page on Facebook. Feel free to drop by.